This week’s blog post features a spectacular pre-Columbian pottery vessel known at the Maryland Archaeological Conservation Lab as the Rosenstock Pot. I have chosen this vessel to frame an essay about the development of agriculture by Maryland’s indigenous population and the consequences of agriculture on native life during a time archaeologists call the Late Woodland period (AD900 to AD1650). The Rosenstock Site (18FR18) is a Late Woodland period village on the Monocacy River in Frederick County. Excavations there by the Archeological Society of Maryland and the Maryland Historical Trust revealed remains of trash-filled pits, hearths, human burials and two buildings believed to have functioned as sweat lodges. Radiocarbon dating of charred plant remains from hearth features showed the site was occupied from AD1335 to around AD1400 (Curry and Kavanagh 2004). of corn under cultivation (British Museum, London). Typical of village sites of this period, the archaeological remains at Rosenstock yielded the charred remains of corn and beans (McKnight 2009). The third player in the much-celebrated Woodland period triumvirate of cultivated plants—squash—was not present in any of the analyzed Rosenstock Site features, but has been found on other sites of the same period in Maryland. These plants, known as the “Three Sisters”, became cornerstones of Native American diet and play a role in the myths and legends of many native cultures. 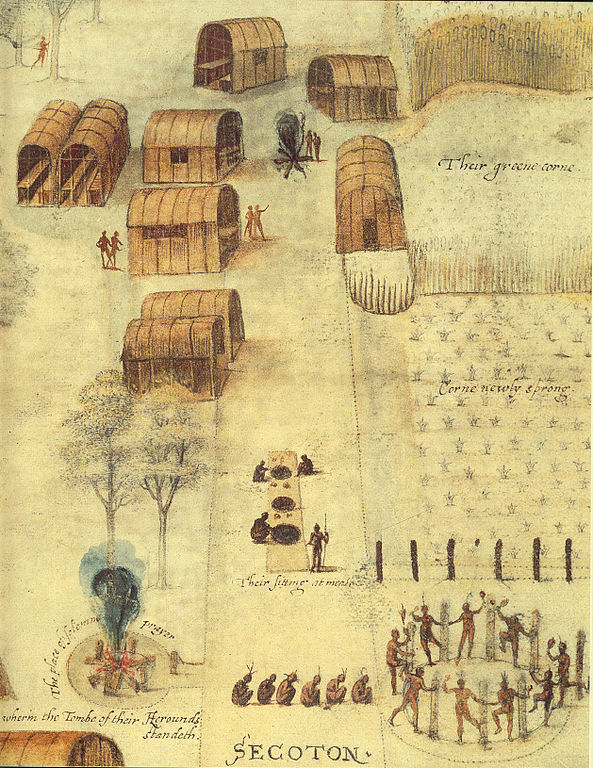 Agricultural life for Maryland’s native population (as well as for cultures all over the world) corresponded with increasing population and the appearance of permanently settled villages. For thousands of years, Maryland’s hunter-gatherer societies had lived a rather peripatetic lifestyle, moving in small bands to hunt and gather wild foods. They resided in short-term camps, moving frequently and presumably keeping personal possessions to a minimum. At first, Native Americans encouraged useful and edible plants growing in and around their camps, practicing a form of horticulture that paved the way to agriculture. These first “encouraged” plants included chenopodium (the goosefoot family, which includes quinoa), knotweed, sunflower, and maygrass and, over time, native peoples probably began selecting and saving seed from these wild plants to create conveniently located stands of vegetation. Horticulture allowed people to reside for longer periods of time in one location, resulting in the development of more complex political and social relationships, accompanied by networks of communication and exchange throughout the Middle Atlantic. True agriculture did not appear in Maryland until after AD200, occurring first in the western part of the state. It was not until after AD1100 that farming based on corn, beans and squash really flourished. Partially as a result of agriculture, the native population had grown significantly by this time, with people residing in larger, permanent villages organized in complex political alliances called chiefdoms. (Maryland Archaeological Conservation Lab, St. Leonard, MD). The Rosenstock Pot, with its semi-conical shape, rounded bottom and constricted neck, is an impressive find. A cord-wrapped paddle had been used to create the distinct surface impressions visible on the pot’s exterior. Standing 36 cm tall and with a rim diameter between 30 and 36 cm, this vessel was most likely used to store food or water. It was just one of many pottery vessels whose fragments were recovered during the excavation of the site. You might be wondering “What does a large earthenware pot have to do with agriculture?” The production of crops often yielded surplus for winter consumption, thus leading to the need to store the extra food. Pottery was one answer to this need. 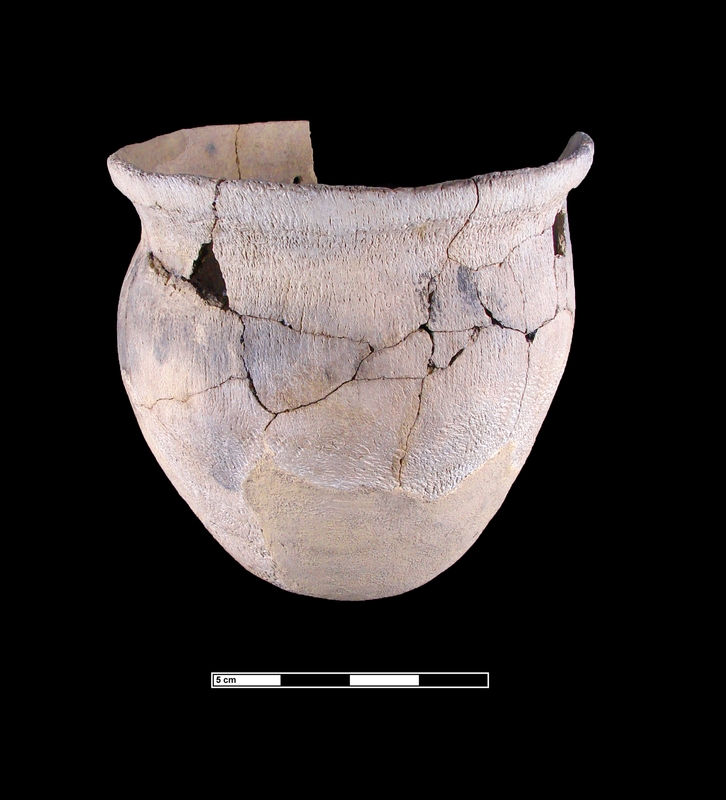 In Maryland, Indians started making unglazed, low-fired pottery a little over 3000 years ago. While the advent of pottery predated the origins of true agriculture by about 2000 years, archaeologists see increasing sophistication of pottery forms and decoration during the Woodland period. Plant remains form an important source of data in archaeological analysis, shedding light on the natural and built environment, diet, health, etc. Too often this valuable data is buried in unpublished archaeological reports that are difficult for researchers to obtain. In an attempt to rectify this situation for Maryland, the Maryland Archaeological Conservation Laboratory, working with paleobotanist Justine McKnight and archaeologist Martin Gallivan, launched a website, Maryland Archeobotany, that centralizes these data in a publicly-accessible and user-friendly format. Data on plant remains from the Rosenstock Site, plus over 100 other archaeological sites from across the state, can be searched from this website. 2004 Excavations at the Rosenstock Village Site (18FR18), Frederick County, Maryland: A Preliminary Report. Maryland Archeology 40(1):1-38. 2009 Study of a Pocket of Cultigens and Direct Dating of Common Bean (Phaseolus vulgaris) from a Late Woodland Context at the Rosenstock Site (18FR18), Frederick County, Maryland. Report submitted to the Maryland Archaeological Conservation Laboratory, Jefferson Patterson Park and Museum, Maryland. 2010 Maryland’s Environment: A 20,000 Year History of Change. Available at http://www.jefpat.org/archeobotany/PDF/PaleobotEssay.pdf. This entry was posted in Archaeology, Artifacts, Excavation, History and tagged agriculture, archaeology, artifact, beans and squash, Corn, excavation, Frederick County, history, Maryland, Monocacy River, Native Americans in the United States, prehistoric pottery, Woodland period. Bookmark the permalink. Great informative and educational post.